As is the case at many universities across the country, academic advising services at CSU campuses are often distributed, or decentralized, across multiple divisions and offices. While this decentralized structure is valued for its support of departmental autonomy and variation in advising approaches in response to local contexts, it poses a significant challenge to ensure adequate communication and coordination across advising units. shared positions or cross-functional advising teams. a senior administrator with campuswide advising oversight. Most of the campus strategies are in the early stages of implementation, and information to evaluate their impact are not available. The administrators we interviewed, however, said that they believe these efforts have the potential to improve relationships across units that have not had a strong history of effective collaboration. 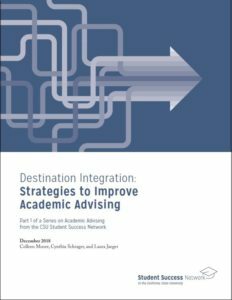 Destination Integration is the first of two reports on academic advising in the CSU system. The follow-up study is scheduled for release in spring 2019.